Today’s Trivia Question: Djokovic and Agassi’s careers overlapped - Djokovic’s career was just getting started as Agassi’s was winding down. But how many majors had both of them in the draw? 1. Two of the all-time greats open their French Open campaigns today. Djokovic and Nadal, who have a combined total of 26 Grand Slam titles between them, begin their semifinal collision course with first round matches against former Top 20 players, Djokovic on Chatrier and Nadal on Lenglen. 2. Djokovic is playing his first match with Coach Agassi. 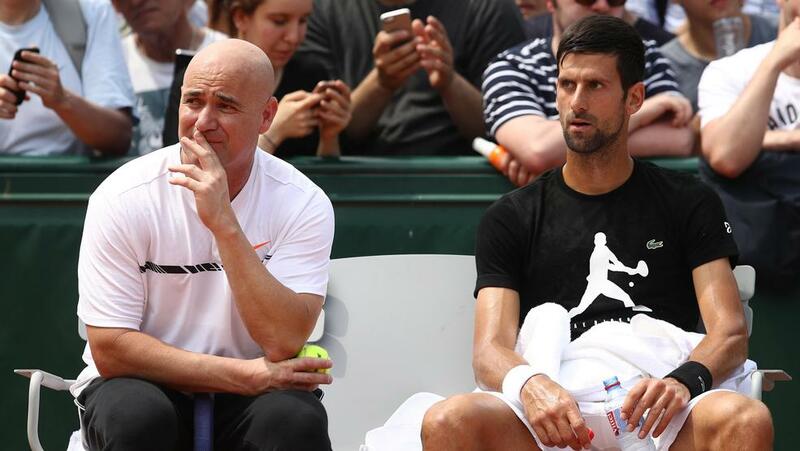 Earlier this month, Djokovic split with his longtime coach Marian Vajda and announced he would be working with Agassi - a fellow Career Grand Slam holder - at Roland Garros. The World No.2 is playing his milestone 50th straight major. 3. Djokovic has absolutely dominated his first round opponent in the past. Djokovic is not only 3-0 against Granollers, he’s 8-0 in sets and 48-10 in games against the Spaniard, a former No.19. 4. Nadal begins his quest for an historic 10th French Open title. No man or woman in the Open Era has won the same major 10 times. Nadal will begin his quest to be the first player to do that with a first round against Paire. He’s beaten the former No.18 in straight sets both times they’ve met. 5. Zverev is playing his first match as a Top 10 player. Following Rome - where he became the first player born in the 1990s to win a tournament at the Masters 1000 level or higher - Zverev broke into the Top 10 at No.10. Today he plays Verdasco, who’s had 22 career wins over Top 10 players. 6. Two French Open champions will square off. Muguruza and Schiavone, the 2016 and 2010 champions here, are first on Chatrier. If Muguruza loses, she would fall from No.5 to the No.15-20 range on the next rankings - if Schiavone wins this title, she’d rise from No.78 to the No.15-20 range. 7. Pliskova is now the highest women’s seed left. The No.3-ranked Czech - who’s seeded No.2 because Serena’s not here - can take the No.1 ranking from Kerber just by reaching the final here. 8. Wozniacki will put her back to the test. The former No.1 retired in her first round match against Rogers in Strasbourg last week due to a back injury. She plays Fourlis today - has she recovered? 9. Three American seeds - Sock, Vandeweghe and Davis - are in action. No.14 seed Sock plays Vesely first up on Court 14, then the ladies are last up on their respective courts, with No.25 seed Davis playing Witthoeft on Court 5 and No.19 seed Vandeweghe playing Rybarikova on Court 14. 10. The first round will wrap up tomorrow. All remaining first round matches will be played on Tuesday, with the second round being played across the Wednesday and Thursday schedules. Yesterday’s Trivia Answer: Kerber and Makarova are the only two lefties to beat Serena at a major.